To make caramel sauce, in 1-quart saucepan, mix sugar, 1/3 cup water and the lemon juice. Heat over medium-high heat until bubbles form and mixture is simmering. DO NOT STIR but occasionally lift saucepan from heat and very gently swirl mixture while sugar is heating. In about 10 minutes, sugar will start to caramelize; resist the urge to stir. Simmer until mixture is a rich, dark amber color. Remove from heat. Immediately, and very carefully, stir in whiskey. Add whipping cream; stir to combine. Cook over medium-low heat about 10 minutes, stirring constantly, until mixture thickens. Remove from heat; set aside. To make blondies, heat oven to 350°F if using glass baking dish or shiny metal pan (325°F for dark or nonstick metal pan). Spray bottom only of 13x9-inch baking dish or pan with cooking spray. In large bowl, stir together cake mix, butter, 2 tablespoons water and the eggs. Stir in toffee bits. Spread mixture evenly in baking dish. 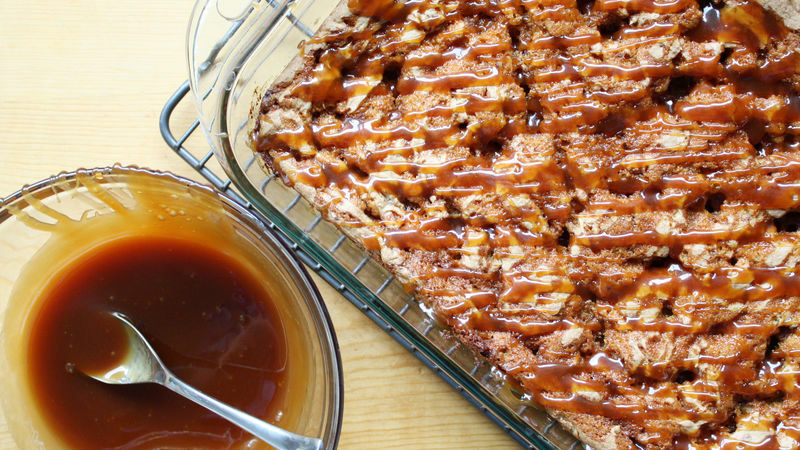 Carefully drizzle about one-third of the caramel sauce evenly over top of mixture. Bake 20 to 25 minutes or until edges are golden brown. Cool completely, about 1 hour. Drizzle another one-third of the caramel sauce over bars; set aside remaining one-third of sauce for a later use. Let bars stand about 30 minutes or until caramel is set. Cut bars into 6 rows by 2 rows; then cut each bar diagonally in half to form triangles. Use the leftover caramel sauce poured over your favorite ice cream, drizzled on sliced apples, or stirred into your cup of coffee for extra flavor. Can’t find French vanilla cake mix? Betty Crocker™ Super Moist™ golden vanilla cake mix is just as tasty.